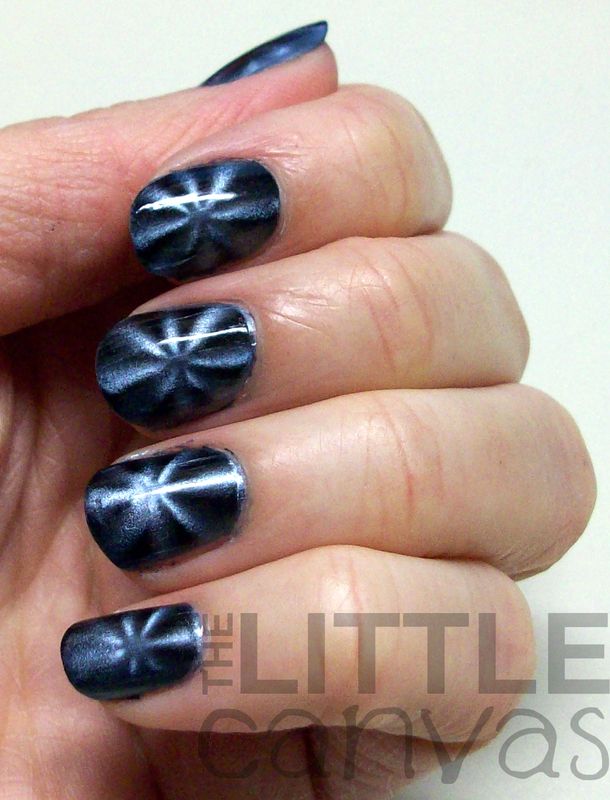 When Nail Art Fails, Use Some Magnetic Polish! So it seems I've hit a manicure funk again. Well maybe I haven't and the ideas in my head were just too big for even my skills. I was planning on doing Spiderman nails originally for my nephews superhero birthday, but well, I'm not as awesome as the Nailasaurus. I then was going to do some really super awesome Batman nails, but I didn't want black nails. I found a city skyline batman nail and since I've done skylines before I knew I could do this. I was so excited and was even going to make the sky look awesome using some magnetic polish, but after 2 nails, I was hating it. It really wasn't that I was hating it, it just was too much work for what I was in the mood to do. I did one nail, but did not wait for any of the layers to dry. 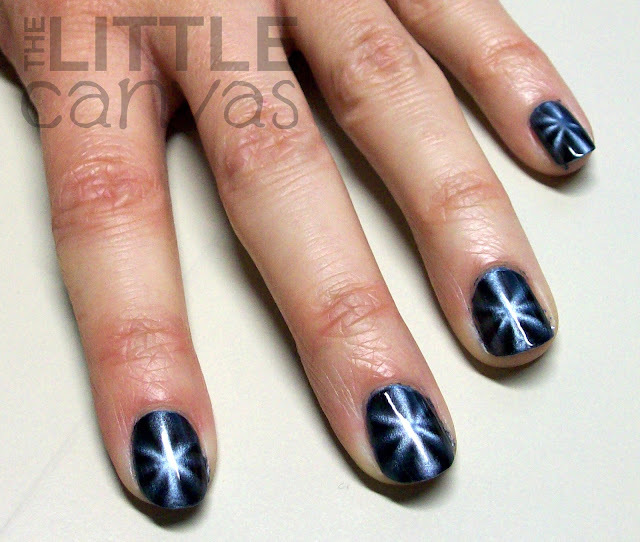 It looked super cool with the starburst magnetic design, the fairy dust stars and the little building. It was my tester nail, so to say, and well, when I went to do the other nails, I was soooooo unmotivated. Then to do a Batman logo on top of it? Nuh uh. I was lazy, my head hurt, and I just wanted something simple and cool. Thank goodness my base was the awesome China Glaze Magnetix Polish provided to me by Big Daddy Beauty (who is holding a sweepstakes if you haven't already seen)! When you have a failure in the nail art department, or you are just too lazy to complete a design, magnetic polish is the way to go! Let's take a look! This is my first successful attempt at using a magnetic polish. When Sinful Colors first introduced their line of magnetic polishes, I purchased one, but quickly returned it after swatching one nail. I personally did not like the effect. I think it was user error on my part, no matter what I did, I could not get the magnet to make the design even on each nail. It came with this small ring with the magnet attached to it and I don't know why, but every time I held it over the nail (perfectly centered) the design came out crooked or it would partially magnetize my polish. It was awful, and I was so upset because it was a really pretty purple color with holo glitter flecks found in a polish like Fairy Dust. This China Glaze polish though is a hole different story. Sure I had some user error fails on a couple of nails, but that was only because I wasn't paying close attention, put the magnet on sideways, or slipped and it hit the wet nail. I'm miss careful as you can tell. 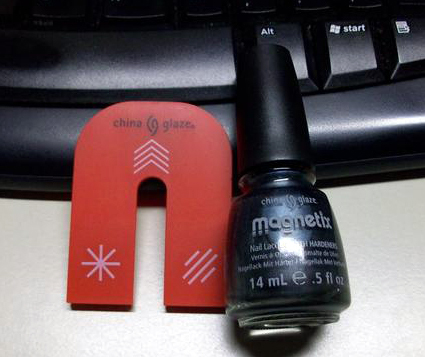 Unlike the Sinful Colors magnetic polish, China Glaze sells their magnets separately from the polish itself. This really doesn't bother me because it allows you to pick which designs you want. I believe there are 6 magentic designs total China Glaze has created with their red magnets. The one provided to me was the starburst design, chevron, and single lines. The other one I believe is swirls, checkerboard, and maybe straight lines (don't hold me too it though). These designs were perfect for me and personally i like them better than the checkerboard ones I've seen floating around the blog-o-sphere. Below is the magnet and the polish. As you can see from this picture and my swatches, Pull Me Close is a blue/black polish. I am a sucker for blues, so when I received this polish, I was really happy. I was even happier when I saw how the effect showed up on the nail. I had complete coverage of the polish in one coat, but when using a magnetic polish you want to use at least 2 coats. If your first coat isn't thick enough and you try to use the magnet, you'll end up with some naked spots on the nail. I loveeeed how the polish looked after the magnet was held over it. The black came to be so apparent and really created an amazing contrasting 3-D look. I'm looking at them now as I type this in awe. It is so simple, and yet leaves you with nails that almost look fake. I'm very pleased with this over the Sinful Colors magnetic polish. What do you think? Ever used a magnetic polish before? 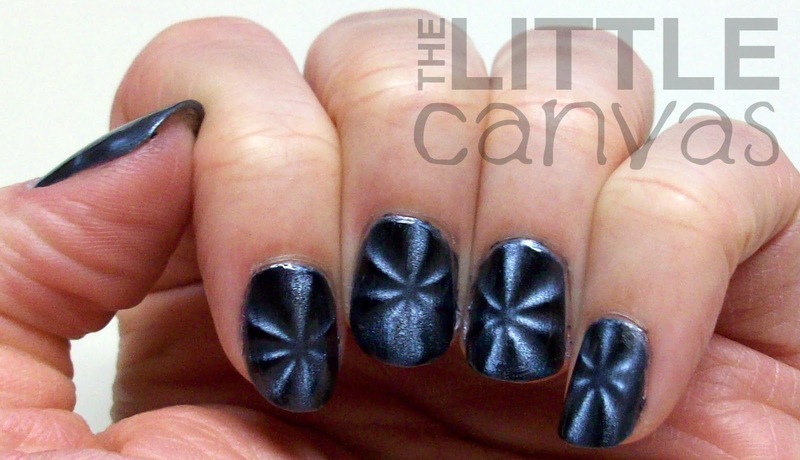 Ever use a China Glaze Magnetix? Like what you see and can't find it in a store? Then click here to purchase the polish from Big Daddy Beauty for $3.99. The magnet can be found here for $3.49. Great deal considering the retail on these polishes over at Ulta are $10.00 and then another $6 to $10 for the magnet! I just purchased another ChG Magnetix after receiving this one! So easy to do when you have little time. Thank you! There you have it.. I feel like I live on another planet, cause this is the first time I ever heard of a magnetic polish! Does it really work that well on nails? I have googled and watched some videos where the result was less intense. But your nails are amazing! Rubber Ducky Nail Art Revisited! Puzzle Piece Nail Art - Essence Off to Miami!